I'd like you to meet my good pal, Baz. He's funny, flirtatious, and a bit of a spaz. I once saw him punch a tank. Just after he kissed a bank. Whilst dancing to improvisational Jazz. Now let's dance guys! Come on the bohemian creative team of Writer: Geoff Johns; Artist: Doug Mahnke; and Publisher: DC Comics in January 2013. Vogue! Whilst Hal and Sinestro walk with an 'old friend' through the 'Dead Zone', back on Earth, Simon (Green Lantern) Baz is having a bit of trouble confronting his armed 'car-bomber'. First, his ring run's out of power. Then, Agent Fed comes' barging onto the scene. After that, the Third Army stumble into play. And finally, a talking squirrel asks Baz for Hal Jordan's location. Boy-Oh-Boy! No wonder why they've called this story 'Innocent Lives', huh? I tell you what though; the Guardians aren't so innocent when they leach more power off of the first Lantern at the end of this issue. FED: Help me arm these. BAZ: How do I do that? FED: You really are innocent. Ha! Pure pith in a can. One of the things that I really did appreciate whilst reading this issue, was the developing relationship between Simon Baz and Agent Fed. At the moment their dynamics remind me of the David Banner and Jack McGee relationship from the seventies 'Incredible Hulk' television series. Coming across one part incremental, and one part charming. If truth be told, I've never been a big fan of the sub-plot that lingers a single page per issue. Granted, I can understand why a writer needs to keep 'many plates spinning' at the same time. Yeah. One hundred percent. But what I don't get is why they don't give us something more than a marginal story-stand? Well, something more than 'I know who you are, Hal and Sinestro. By the way, you're both dead'. Too fleeting for my own tastes. Know what I mean? Part of me wants to say that the most innovative thing in this comic is the talking squirrel. Whilst another part of me wants to say that the most innovative thing is the way in which Simon's confrontation got more and more hectic over time, without it seeming like a farce. I know what? I say them both. DING! 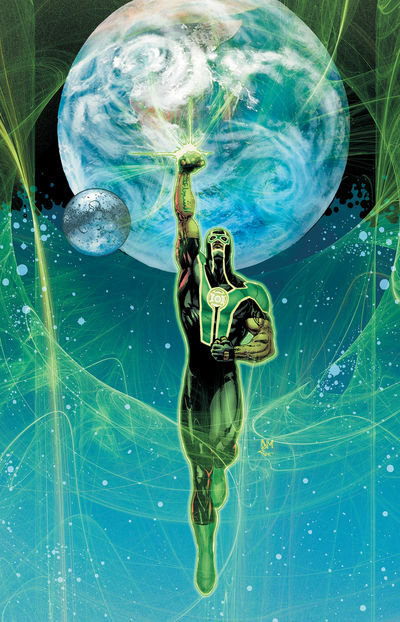 BAZ: Still sticking to this month's plant-based casting-call theme, dear reader, and still in the right frame of mind into casting this die-hard GL as a 'Vanilla' flower. Well, this is a very versatile plant don't you know. It's nice to look at, and has a bittersweet aftertaste which is very Moorish. FED: Did you know that a Water Lily is a very adaptable plant? Not only does it help oxygenate the water surrounding it, but it also gives me a target to aim for when I want to have a squirt in my father's garden. Nice. Like Mister Fed. 'What now?' -- Kim Kardashian, whilst she is in the shower. Conceptually this is a yarn where a man keeps on getting interrupted again and again and again, right? Therefore, why not compare it to the Jack White song, 'Love Interruption', just without the love. In many different ways this issue of 'Green Lantern' pretty much defines its current state of play. One part of it is charming and warming -- especially the interpersonal scenes. Another part of it is brief and hollow -- mainly the meandering sub-plots. Plus yet another part of it is timely yet new -- like any good recon should be. Still, I would honestly like more. Each week I feel as if I'm missing something from this title, something called stability. Gone are the days when a story was a thing in its own right. Now is a time for long drawn out epics that don't seem to end! Granted, on occasion, I don't mind this sort of thing. But for the life of me, this series hasn't had a decent bit of 'down time' for many-many years. Come on DC. Pull your finger out. Allow the creators to tell a tale and not a story-arc. Trust me; it'll be a nice change of pace.